"Far in the future, the World Controllers have finally created the ideal society. In laboratories worldwide, genetic science has brought the human race to perfection. From the Alpha-Plus mandarin class to the Epsilon-Minus Semi-Morons, designed to perform menial tasks, man is bred and educated to be blissfully content with his pre-destined role. But, in the Central London Hatchery and Conditioning Centre, Bernard Marx is unhappy. Harbouring an unnatural desire for solitude, feeling only distaste for the endless pleasures of compulsory promiscuity, Bernard has an ill-defined longing to break free. A visit to one of the few remaining Savage Reservations where the old, imperfect life still continues, may be the cure for his distress…"
Brave New World is a very disturbing but interesting science fiction classic, opening with chilling descriptions of the hatchery, where human babies are "decanted" and then trained to abhor books and flowers and the other classes by brainwashing (sometimes during their sleep). Many parts of Brave New World were really nightmarish, with the human conceptions of right and wrong and what's immoral completely turned upside down. It just goes to show that it's all convention, that people will believe what they're told to, that "mother" and "father" and "home" can be turned into dirty, disgusting words. I almost put Brave New World down several times, but since I was reading it for a book club, I struggled on. It is a good book, just almost too good in terms of the images it conjures up. I'm not a big fan of super chilling or scary science fiction. Disturbing, unsettling, I can deal with it. But something like The Martian Chronicles...no thanks. Brave New World isn't quite one of those books, but almost. Like most sci-fi novels, it deals with a dystopian society where everyone is content with their miserable lot...except one main character who begins to question everything he/she's has held to be true. In the case, the questioning figure is sort of a combination of Bernard Marx and Lemina. 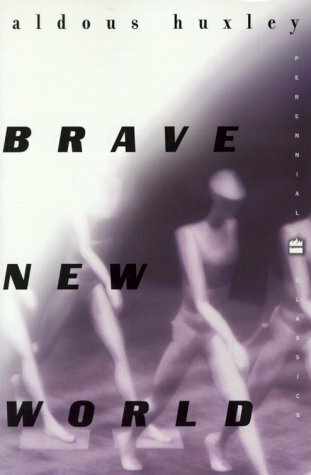 Brave New World is narrated in a pretty odd way at times, with sections where each sentence alternates between or two (or three) scenes and conversations. It never felt very direct, but once I got used to that style, I liked it well enough. There was also a more traditional style of narration, which was good too. Brave New World was pretty absorbing, although not super suspenseful. I was interested in the main character though, and in the deeply disturbing world that Huxley created. It's so much better and so much more chilling than any science fiction realm in YA; those mostly center around the same themes and the same style; Brave New World's setting is unlike any of them, and it's more scary for it. Some of the most chilling scenes of all were the characters' nonchalant descriptions of goings-on that today would be considered immoral and not fit for polite company, while simultaneously grimacing at the words "father" and "mother" and being unable to conceive of the idea of home. That's where Huxley is at his most effective, I think. Those words mean so much to us now, that to imagine them devalued is awful. Just think about it for a second and shudder. A lot of the sections were shudder-worthy, actually. There's also the notion that when you're blue you just take some drugs to forget about it, just dull yourself to a point beyond feeling. Soma is now the solution to everything; it basically puts all the strong emotions to sleep. I think 1984 as a novel is a lot easier to understand when reading by yourself, but that's not to say Brave New World isn't as good. It's just harder to "get" and harder to read. It was a good book to read with a book club though, so I was glad of that. We talked about a lot of stuff, mainly about the Director playing God, the disturbing conditioning, and the prevalence and significance of soma, among other things. I'm glad I got to Brave New World eventually, and it's certainly a book worth reading, bringing up so many issues. It was first published in 1932, but it's still very relevant today, though perhaps not as much as Fahrenheit 451. I enjoyed it a lot.